Are you ready to coat your garage floor? It's not as expensive and time consuming as you may think. Call Kwekel Services, LLC today and well arrange to give you a free, fair quote. Within just a few days we can have your garage floor coating complete. Since their introduction in 1986, garage floor epoxy coatings have come a long way in terms of durability and selection. You can choose from a variety of colors and effects to create the look you have in mind. Garage floor coatings come in just about every color imaginable. You can also choose stone or marbling looks for more interesting effects. Choose a matted finish or high gloss. You might even choose to add anti skid particles for added safety. Call Kwekel Services, LLC today at (844) 288-9114 to discuss your garage floor coating desires. Whatever you choose, when you call Kwekel Services, LLC you'll be getting a top quality coating product and a crew with the expertise to apply it properly. 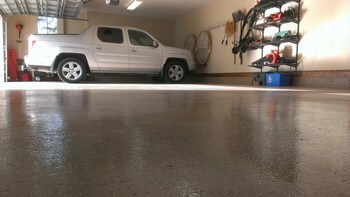 Epoxy garage floor coatings will provide a stain-resistant surface that looks great and is easy to clean. What's more, water will bead on it and wipe clean. Dirt and sand will be easily swept away. You can even add anti-skid chips to increase safety on those wet days. The garage epoxy experts can transform your dingy garage into a sparkling home entrance within just a few days, and you'll feel the effects for many years to come. When you call Kwekel Services, LLC to apply epoxy coating to your garage floors, you'll be getting the epoxy experts! We've been coating garage floors since 1986. Utilize our industry experience and you'll receive top products and craftsmanship that will have your garage floors looking shiny and new for years to come. Call (844) 288-9114 today for a free garage epoxy quote.